OMEGA’s FST-320 Series thermal dispersion flow switches, especially designed for use with gases, sense changes in the heat transfer characteristics of the gases. Flow velocities from 1 to 90 fps are effectively monitored. The flow switch incorporates a standard SPST Relay switch output for control flexibility. The OMEGA® LVCN-131 and LVCN-141 controllers can easily be interfaced to perform a variety of control functions. 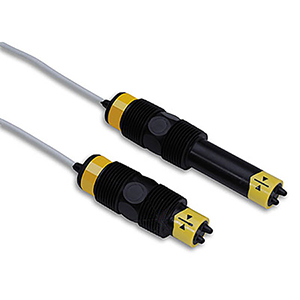 The FST-320 family of sensors can be easily installed in line sizes ranging from 3/4 to 12". 참고: Comes complete with operator’s manual. To order with 7.62 m (25') cable, add suffix "25" to model number, add $20 to price for PP/PVDF, or $75 for PVDF. To order with 15.24 m (50') cable, add suffix "-50" to model number, add $40 to price for PP/PVDF or $150 for PVDF.